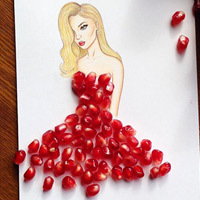 Talented Armenian artist Edgar Artis draws beautiful girls and dress them into beautiful gowns made from everyday objects like burned matches, pomegranate seeds and even blue sky. At first glance, his creations look like the kinds of fashion drawings you might see in a magazine or on the package for a dress pattern. But look closer, and you’ll see that the real world is very much part of the dresses he’s created. That’s because his dresses are actually windows, and the patterns you’re seeing are the views beyond! You can follow him on Instagram & Facebook for more updates.